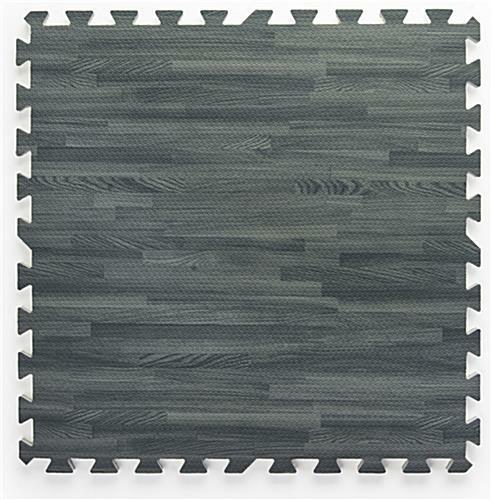 This set of gray wood grain floor mats will add style, sophistication, and comfort to your tradeshow or retail space flooring. 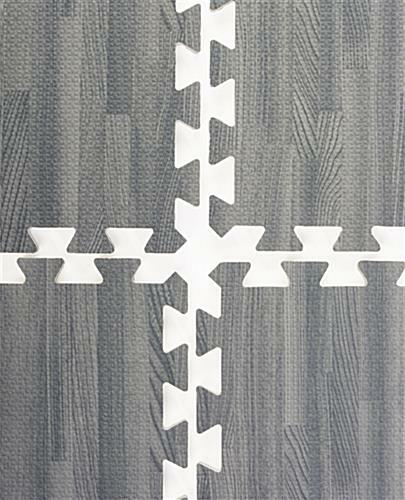 Sold in a set of 26, these 2’ x 2’ interlocking foam tiles fit together like a jigsaw puzzle to form a seamless 10’ x 10’ ground covering. Made out of a soft EVA foam material, your feet will notice the comfort of the cushioned flooring. These anti-fatigue floor mats are resilient, light, portable, and water resistant. 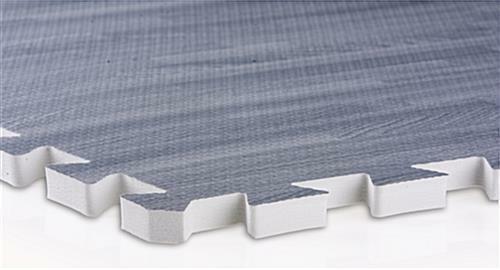 With interlocking foam tiles, installation isn’t just fast and easy - it’s fun, too! 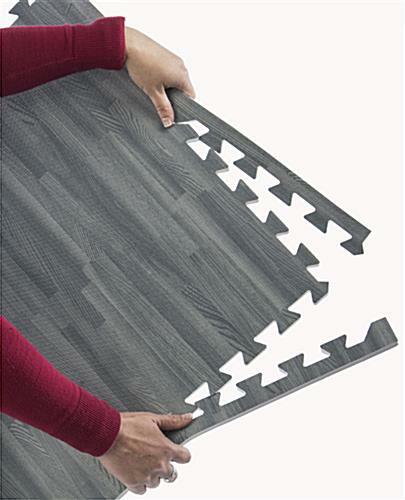 Each set comes with detachable straight edges so that you can create your own sized flooring unit. If you want to make your tradeshow or expo space look and feel great, these soft cushioned floor mats are perfect for you. This was our second conference that we used this product. It really brings out our booth. The quality is also fantastic. I ordered the flooring days before the conference and it was there ready to be put down. We will be using this flooring for all our upcoming conferences. Thank you. Pat, thank you so much for taking the time to write this excellent review! 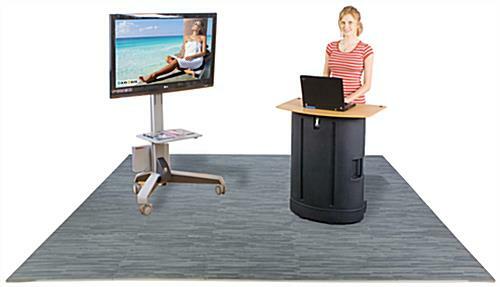 We're so happy to hear that our floor mats are really bringing out the best in your booth, and we love that you'll be using these for all of your upcoming conferences. If you post a photo of your booth on social media, be sure to use #displays2go and we'd be happy to share it with our customers for inspiration. These floors are so comfortable to stand on for long periods of time, even in high heels! We used them at a convention, and attendees and other vendors kept commenting on the nice quality floors. We have since purchased 5 more sets to use across the rest of our company. Thanks! 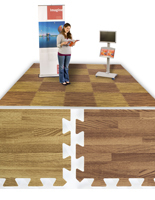 We order this flooring for all of our trade shows. It looks great, and holds up well throughout the week. It's also way more comfortable than the trade show carpet that we used to order. 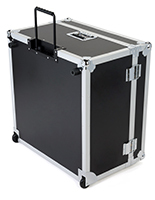 Our product has always showed up on time with no difficulties. Christopher, thank you so much for taking the time to share your photo and write this amazing review! 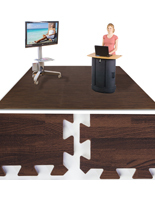 This flooring looks great at Stream Monkey's booth, and we're so happy to hear that it was so comfortable and durable. 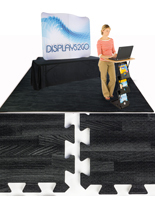 We hope you continue to use Displays2go for your business and trade show needs! The floor mat arrived very quickly. We have not used it at trade shows yet, but we did take out a few pieces for inspection. The foam is a little over an inch think. It is pretty firm, so I don't know if it is going to add much support on cement floors but we will find out in December. 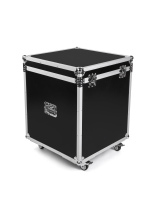 The design looks very nice, and I think will make our space look nice when it is set up. I loved how this floor looked, it really helped our booth look even better! It was comfortable to stand on, and relatively easy to put together My cons were that when people wore heels on it, the floor broke (small holes) also, some of the colors were off, a few were more blue than gray, and finally, some of the edges started peeling. Overall was happy with it though. 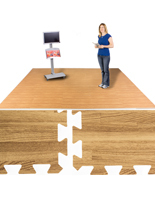 While we are thrilled to hear that your trade show flooring looked great and helped your booth stand out, we'd like for you to be 100% happy with your purchase. A customer care specialist will be reaching out to follow up with you on the mismatched colors and quality to see if there is anything we can do to help. Thank you for letting us know of this issue.